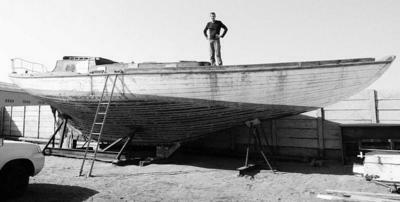 My Boat 51 Foot wooden Cutter circa 1940. “Active” was found in a scrap yard in Walvisbay, Namibia. She was ready to be cut up for picture frames. Solid condition but been on the dry for 27 years. Most of the interior has been taken out but structurally she seems sound. Project to start in January 2014. It might be a desert but when you look closely there is immense beauty and lots of life. The road takes you 450km through the desert. We drove 300 km before seeing another car. Have you made it to Simons Town yet? Saw on FB that you are looking for participants. I look forward to reading updates on your journey. Likewise, I will be refurbishing Frolic, a boat I bought recently. Here's an article on Active back in 1971. Do you know who built her or what type boat she might be? What fantastic lines a truly beautiful ship. Please keep us all updated on progress.